YVY’s Early Head Start program began in 1998 with a grant from the federal government to serve infants and toddlers ages 0–3 years. YVY’s Early Head Start, one of the first in Brooklyn and Staten Island, has three components: Center-Based Early Head Start, Home-Based Early Head Start, and Programs for Expectant Moms. This program is also funded by the federal government and provides childcare as well as age-appropriate educational programs to income eligible infants and toddlers. Governance of the program must comply with the same guidelines as the regular Head Start program. EMP provides services to 54 women in Boro Park and Williamsburg, through education, empowerment and support during their pregnancy and their post partum stage. YVY, in its effort to meet the needs of the whole child, has also collaborated with New York City’s Day Care Program which provides child care services to income eligible pre-school children. This allows YVY to offer enhanced Head Start services to children and families enrolled in the Day Care Program at four YVY sites. 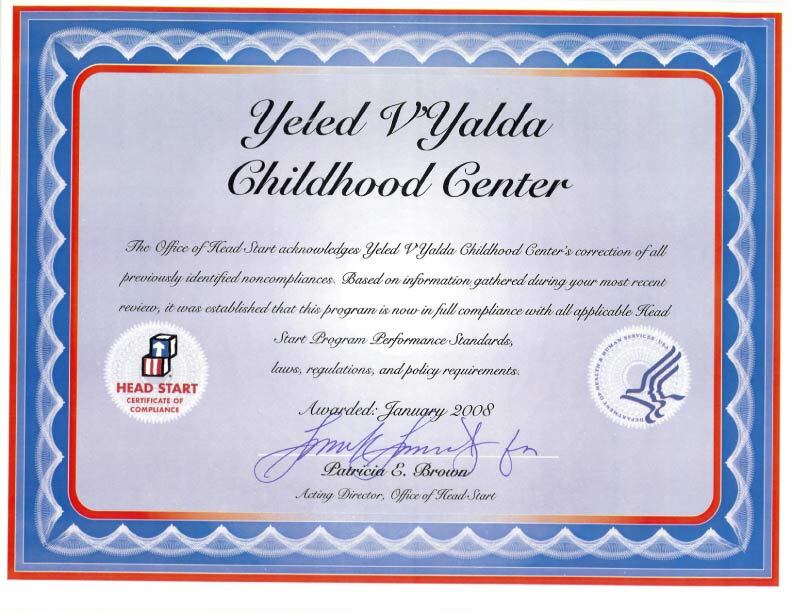 One of Yeled v'Yalda's newest initiatives, this program services children ages 3-5 years who have been diagnosed with a serious and/or chronic illness, such as cancer, congenital heart defect, seizure disorder, etc. Structured on the home- based Head Start model, individualized services can be provided both in the child's home and/or their treating hospital, allowing children who cannot attend a preschool program to benefit from ongoing educational and social-emotional support. Partnering with organizations like Chai Lifeline and the American Cancer Society, as well as New York based hospitals, Project REACH's goal is to provide support to the entire family who may be struggling with their child/sibling's medical needs. Like all of YvY's programs, Project REACH utilizes a child-centered learning model which focuses on addressing the unique needs of each child. It uses a curriculum aimed at nurturing the development of the whole child, addressing the cognitive, linguistic, social, emotional, and physical domains. Home visitors spend 90 minutes at either the child's home or hospital each week, enabling the child to learn at his/her own pace while simultaneously undergoing medical treatment. Monthly group socializations for the entire family are also offered in an effort to foster healthy social behaviors in the children, educate parents about various pertinent topics, and encourage families who encounter similar medical struggles to meet and gain support from each other. The Head Start program requires that 10% of enrolled children have identified special needs. In order to fund the necessary therapies for special needs children enrolled in Yeled V’Yalda Head Start and Early Head Start, YVY sought and received approval through the New York State Education Department and the New York City Department of Health to become a provider of Special Education and Early Intervention services. YVY’s Special Education Division now provides these services to children at all YVY sites. At YVY Head Starts, teachers, social service staff, education staff, parents and therapists are able to work in seamless collaboration to serve all special needs children. Head Start/Early Head Start staff work closely with service providers to incorporate the goals of the Individual Education Plan (IEP) or Individualized Family Service Plan (IFSP) into the curriculum. The YVY Special Education Division also addresses the needs of children in other Head Start and non-Head Start sites, within the parameters of its city and state contracts. YVY is an approved evaluation site, as well as a provider of related services (speech therapy, physical therapy, occupational therapy, and counseling) and Special Education Itinerant Teachers (SEIT). YVY’s team of professionals conduct multidisciplinary bilingual and monolingual evaluations for children ages 3-5 years through the Department of Education (DOE) Committee on Pre-School Special Education (CPSE). The recommendations of the evaluators, which include parents' input, are incorporated into an Individualized Education Plan (IEP) to address the developmental needs of the child. Teachers work with service professionals to support the goals of the IEP in their curriculum, and parents are encouraged to work with these goals at home. Any child with a suspected disability can be referred for both assessment and treatment of cognitive or developmental disabilities. If parents suspect that their child may have delays, they can have the child professionally assessed to assure that any deficit is addressed. YVY carefully matches each child with an appropriate therapist and is always sensitive to parents’ concerns. YVY’s dynamic group of related services professionals with exemplary skills provide speech therapy, occupational therapy, physical therapy and counseling services for children age 3 to 21 years. All of YVY’s therapists work under close supervision and undergo constant training to help them keep their skills up to date. Specializations address the varying needs of the special needs child. These specializations include, among others, expertise in sensory integration, brain gym, cognitive therapy, social skills training, voice disorders, oro-motor deficiencies, fluency, kineseotaping, and Applied Behavioral Analysis (ABA) training. Children receive services at the Head Start site, Day Care center, Preschool or Elementary School, in the classroom or out (as appropriate) or, occasionally, at the child’s home. YVY also provides two fully-equipped therapy gym centers with state of the art therapy equipment, one in Boro Park and one in Williamsburg, which offer specialty equipment for more significant needs. A therapy pool is a new addition to YVY’s specialty services, allowing for the benefits of therapy in an aquatic setting. More than 4,000 children ages three to twenty-one are currently being provided with speech therapy, occupational and physical therapies, SEIT teachers and counseling services through YVY’s Special Education Division. For over a decade, Yeled V'Yalda's ABA program has been working to help our children move ever forward in their quest for developmental growth. Our goal is to enable children to achieve maximum potential in their homes, schools, and communities by utilizing our intensive approach to learning. At present Yeled has four ABA sites [Boro Park, Crown Heights, Flatbush and Williamsburg] where we are currently servicing close to 90 children. Each site is able to inculcate the culture of their community, ensuring that family partnership be an integral part of the therapeutic process. The clinical director of each site is a Board Certified Behavior Analyst [BCBA] who partners with our ABA trained, licensed therapists to best service our children and their families. Our administrative director ensures that all mandated services are provided in a manner that best addresses the needs of each child. In addition, Yeled employs a world-renowned ABA consultant to regularly visit our sites offering ongoing professional training and guidance. Trainings, workshops and seminars for our staff are mandatory. Training for the 2011-2012 school year, to date, included two days of workshops by J. Tyler Fovel founder of Strategic Alternatives, a company that specializes in ABA program development and delivery. Tyler is a Board Certified Behavior Analyst and is a senior consultant for ABA programs in Massachusetts and Connecticut. Tyler guided us in updating our assessment, intake and program writing protocols. Staff members also attended an insightful training by Michelle Garcia Winner. Michelle Garcia Winner, MA, CCC-SLP, specializes in the treatment of individuals with social cognitive deficits. During the course of her training, members gained a comprehensive understanding of methodologies that can be best utilized to specifically address deficits in the social thinking process and related social skills. Another very informative seminar presentation attended by Yeled's ABA staff, was given by Mitchell Taubman [Ph.D], Ron Leaf [Ph.D] and John McEachin [Ph.D.], authors of one of the most frequently used guides for writing ABA programs, "A Work In Progress: Behavior Management Strategies and Curriculum for Intensive Behavioral Treatment of Autism". The workshop discussed in great detail and clarity the acquisition of social skills. The 2011-2012 school year has begun with intensive therapeutic intervention for all our children. Here at Yeled's ABA Center we inculcate a "whole child" approach whereby a team of professional, highly- qualified and talented individuals, partner to best meet the needs of children and their families. Early Intervention Program Parents of children newborn through age 3 who have a premature child or who feel that their child’s development is lagging behind that of his or her peers can contact the NYC Department of Mental Health and Hygiene Bureau of Early Intervention to access the Early Intervention Program. The NYC Department of Mental Health and Hygiene Bureau of Early Intervention telephone # for referral of a child is 718-722-3310. YVY’s highly- skilled state- licensed staff provides bilingual and monolingual evaluations and therapy services. The recommendations of the evaluators to address the developmental needs of the child are incorporated into an Individual Family Service Plan (IFSP) with the parents' input. YVY Service Coordinators are sensitive to parents’ concerns and are well-versed in the kinds of resources available to children. Parents and caregivers then work with service professionals to support the goals of the IFSP and are encouraged to follow through with supporting activities between therapy visits. Services children can receive through the EIP include speech therapy, occupational therapy, physical therapy, special education/special instruction, counseling, family training, nutrition services, and vision therapy. Services take place in the natural environment of the child, whether in a day care center or at home. In the event that services take place in a child care setting or community setting that requires a fee, the parent is responsible to pay any associated cost with such access to child care and community setting. YVY is contract provider for Agudath Israel of America to provide services to school- age student at risk of substance/drug abuse. These services are provided in private or parochial elementary or high schools for students at risk. Services provided through this program include individual counseling, parent counseling, therapeutic remediation, staff development, parent training and a mentoring program. YVY provides the specialty staff who provide these services based on the individual needs of each school. • To help guide our children towards positive emotional and cognitive growth. This occurs through the development of age appropriate personal and interpersonal behavior. • To provide staff and parents/guardians with contemporary insights in the child development process. • To assist in the early identification of children with disabilities. • To help focus and integrate home and community resources in an individualized child centered program. • To foster a positive attitude towards mental health services, and their role in individual child development. • To identify and promote availability of community-based mental health services to our children and families. Research studies demonstrate that children who have their father involved in their life on a regular basis do better in school, have higher self esteem, and are less likely to be involved in criminal and gang related activities. (http://www.fatherhood.org/history.asp) Yeled V’Yalda Head Start stresses the importance of having fathers and male role models involved in their children’s life. Our goal is to increase father involvement in the daily lives of their children. Fathers are encouraged to participate in home visits, scheduled conferences with teachers, and special events at school. In addition, Yeled V’Yalda offers an ongoing Father’s Group titled: The Father Chevra and given by Dr. Edward Kaminetzky, Certified School Psychologist; Director of Mental Health.